by Charles J. Elmore Ph.D. 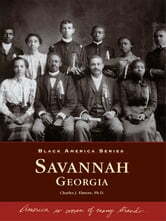 Pioneering African-American families, spanning generations from slavery to freedom, enrich Savannah's collective history. Men and women such as Andrew Bryan, founder of the nation's oldest continuous black Baptist church; the Rev. Ralph Mark Gilbert, who revitalized the NAACP in Savannah; and Rebecca Stiles Taylor, founder of the Federation of Colored Women Club, are among those lauded in this retrospective. Savannah's black residents have made immeasurable contributions to the city and are duly celebrated and remembered in this volume.